This post will guide you how to use Excel FIND function with syntax and examples in Microsoft excel. The Excel FIND function returns the position of the first text string (sub string) within another text string. It can be used when you want to get the position of a sub string inside another text string. so it will return a number that indicates the starting position of sub string that you are searching in another text string. The FIND function is a build-in function in Microsoft Excel and it is categorized as a Text Function. Note: The FIND Function is case-sensitive. The FIND function is available in Excel 2016, Excel 2013, Excel 2010, Excel 2007, Excel 2003, Excel xp, Excel 2000, Excel 2011 for Mac. start_num-This is an optional argument. It will specify the position in within text string where the search will start. If you omit start_num value, the search will start from the first character of the within_text string, in other words, it is set to be 1 by default. So you can use the Excel Find function to look for the specified text starting from the specified position. The Find function will return the position of the first character of find_text in within_text argument. If there are several occurrences of the find_text within another text string, it only return the position of the first occurrence. If the find_text is an empty string, the position of the first character in the within_text is returned. If the find_text string is not found in within_text, it will return the Excel #VALUE! Error. If start_number value is not greater than 0, it will return the #VALUE! Error value. As the FIND function is case-sensitive. If you want to do a search that is case-insensitive , you can use the SEARCH Function. The FIND function does not support wildcard characters, so if you want to use wildcard characters to find string, you can use SEARCH function in excel. The below example will show you how to use Excel FIND Text function to find the position of a sub string within text string. When you look for the text “how” in the Cell B1, it will return 6, which is the position of the first character of find_text “how” within the Cell B1. In the above example, it specified the start_num value as “3“, so you will get the position of the first character “h” of the searched string “how” within the value in Cell B1 when the starting position is 3. it returns 6. The Example 1The search will start from the third character of the value in Cell B1. when you set the starting position as 1, it will return the position of the first “excel” string in the value of Cell B1. 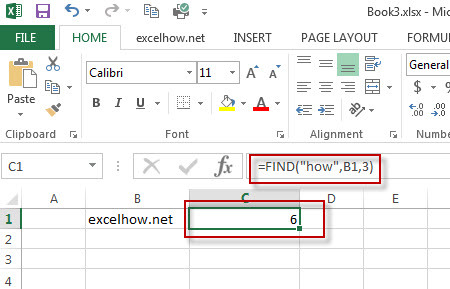 When you set the starting position as 3, it will return the position of the second “excel” string in the value of Cell B1. The search will start from the third character of the value in Cell B1. In the above example, when you look for an empty string in Cell B1 with the starting position as 1, and it will return the position of the first character of the within_ text (the value of Cell B1). In the above example, when you look for the text “word” in Cell B1 and the string position is 1, it will return a #VALUE! error, As the searched string “word” is not found in Cell B1. #6 Searching for a text as “excel” in Cell B1 and the starting position is a negative number. If the starting position is not greater than 0, it will return a #VALUE! Error. 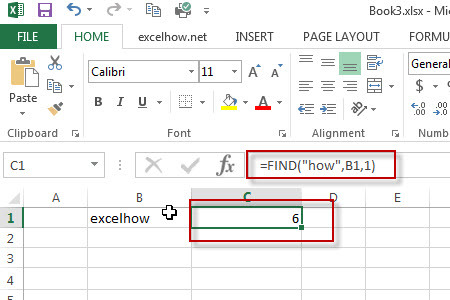 As the FIND function in excel is case-sensitive, when you look for the string “EXCEL” in Cell B1, the searched string “EXCEL” is not found, the function will return a #VALUE! error. Question 1: the FIND function returns a #VALUE error when it do not find the searched text within another string. I want to know if there is another excel function in combination with the find function to handle the error message to return the actual value, such as: -1 or throwing others exceptions via returning values, like: -1,0 or FALSE. The FIND function will locate the position of the searched text “excel” within Cell B1, and the ISNUMBER function will check the result returned by the FIND function if it is a number, if TRUE, then return TRUE, otherwise , returns FALSE. then the IF will check the Boolean value returned by ISNUMBER function, If TRUE, then returns the numeric position returned by the second FIND function, If FALSE, returns “not found” string. The find function will return the position of the first wildcard (**) character within a string in Cell B1. you need subtract the numeric position returned by FIND function from the length of the string in Cell B1 to get the length of sub string to the right of the wildcard character(asterisk). then the RIGHT function extracts the rightmost characters based on the length of sub string. Question 3: I am trying to extract the first word from another text string separated by space character. but it always return a #VALUE error message. I think it should be use the FIND function in combination with another function, such as: left function. but I still don’t know how to combine with those two functions to extract the first word. The find function returns the position of the first space character in the text string in Cell B1. the Formula “=FIND(” “,B1)-1 returns the numbers of the first word as the second arguments of the LEFT function. If the text string in Cell B1 just only contains one word, then the find function will return #VALUE error. to handle this error, you need to use the IFERROR function, if the find function is not find the space character, then return the text string in B1. in other words, it just contains only one word in Cell B1. Question 4: I am trying to extract an email address from a text string in Cell B1. how to write a excel formula to achieve the result. Answer: you can use a combination of the TRIM function, the LEFT function, the SUBSTITUTE function, the MID function, the MAX function and the REPT function to create a complex excel formula to extract email address from a string in Cell B1. Question 5: I am trying to get the first name from a full name separated by a comma character. how to use a excel formula to extract the first name from a name as: “Last name, First name” format. If you want to get the workbook name and its path only without worksheet name, you can use a combination of the SUBSTITUTE function, the LEFT function, the CELL function and the FIND function….